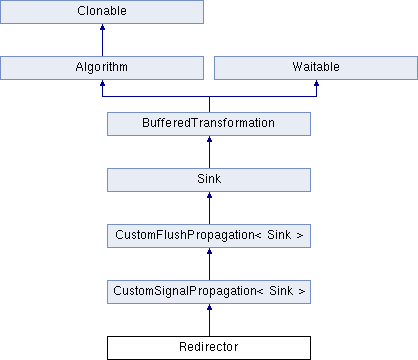 Redirect input to another BufferedTransformation without owning it. Definition at line 833 of file filters.h. Definition at line 838 of file filters.h. Definition at line 859 of file filters.h. Redirect input to another BufferedTransformation. Definition at line 864 of file filters.h. Determines whether input can be modified by the callee. The base class implementation returns false. Definition at line 875 of file filters.h. Initialize or reinitialize this object, with signal propagation. Initialize() is used to initialize or reinitialize an object using a variable number of arbitrarily typed arguments. The function avoids the need for multiple constructors providing all possible combintations of configurable parameters. Definition at line 474 of file filters.cpp. Definition at line 879 of file filters.h. the number of bytes that remain in the block (i.e., bytes not processed). 0 indicates all bytes were processed. Definition at line 889 of file filters.h. Definition at line 891 of file filters.h. Definition at line 893 of file filters.h. Some objects, like ArraySink(), cannot create a space because its fixed. In the case of an ArraySink(), the pointer to the array is returned and the size is remaining size. Definition at line 896 of file filters.h. Input multiple bytes for processing on a channel. channel the channel to process the data. Definition at line 906 of file filters.h. Input multiple bytes that may be modified by callee on a channel. Definition at line 908 of file filters.h. Flush buffered input and/or output on a channel. Definition at line 910 of file filters.h. Marks the end of a series of messages on a channel. Definition at line 912 of file filters.h. GetWaitObjects is usually called in one of two ways. First, it can be called like something.GetWaitObjects(c, CallStack("my func after X", 0));. Second, if in an outer GetWaitObjects() method that itself takes a callStack parameter, it can be called like innerThing.GetWaitObjects(c, CallStack("MyClass::GetWaitObjects at X", &callStack));. Definition at line 917 of file filters.h.